"Yoga unites or integrates the body with the mind. This integration is the foundation for Self-realization." I have been keenly interested and involved in fitness and health for over twenty-eight years. I am registered with Yoga Alliance as an E-RTY 500®, Experienced Registered Yoga Teacher which is the highest level currently available. I am a CYT 4,900 and Kest trained teacher. I have over 10,000 hours of teaching yoga and 1,000s more in personal practice. I am registered with the International Association of Yoga Therapists. As a result of my love of yoga and teaching, I am currently on the Senior Faculty of Charlotte Yoga Teacher Training Program, Grace Productions Yoga Teacher Training Program and Power Alignment Yoga ™ Teacher Training Program. My career in Health and Fitness began after I graduated high school in 1983. I started teaching aerobics at our local gym. I didn't know a lot about it at the time, but I loved to teach. As the years went on, I continued honing my aerobics teaching skills at local gyms. During this time, my mother was diagnosed with Breast Cancer and I became more dedicated than ever to a healthy lifestyle of exercise, proper nutrition, and stress management. In 1994, I developed debilitating muscle spasms in my lower back. I couldn't walk for a week and I couldn't work for a month. I just lay in bed and took anti-inflamitories and other pain medication. I worked with chiropractors which gave me relief from the pain, but with a genetic history of back problems (my aunt, uncle, and grandfather each had spine fusions but their pain was still there) I knew I would have to find a solution for my chronic pain. I began practicing yoga as a therapy for my back. The yoga worked. Soon after beginning my practice, I realized that I no longer awoke with a sore back, and I was able to resume all activities with more range of motion than I had before the spasms. In 1999, my husband and I moved to Charlotte, N.C., so I could be close to my sister, Grace. Grace had been studying yoga with Bryan Kest - an American yogi who helped bring Power Yoga to the mainstream population. I began daily Power Yoga practice with Grace, and soon we added Ashtanga and Hot 26TM to the practice. 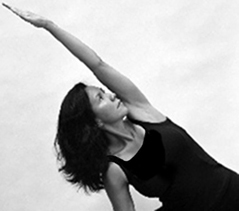 Grace went on to open Charlotte Yoga, the first Power Yoga studio in Charlotte, N.C. When I moved to Florida in 2000, people were hungry for Power Yoga, and I started teaching it at the Deland YMCA, then Varsity Rehabilitation and Wellness Center in New Smyrna Beach, Blue Sky Yoga Center in Deland, Yoga 1, Solutions Center, Mount Dora, Yoga Central of Mount Dora, and Gold's Gym all of Mount Dora, Red Tail Golf Club, Sorrento, RDV Sports Plex, Maitland, InBalance Yoga and Pilates and Guruv Yoga both in Lake Mary and at Jeweled Lotus Yoga in Leesburg. I continue to expand my yoga training, and because of my own interest in healing, in March of 2002, I became certified in Yoga of the HeartTM, Cardiac and Cancer Teacher Training, which was taught and created by Nischala Joy Devi, co-founder of the Commonwealth Cancer Help Program and former director of stress management for Dr, Dean Ornish's Lifestyle Program for reversing heart disease. Because of my love of Alignment Yoga and Power Yoga, I created, developed and have held the Trademark for Power Alignment YogaTM since 2004. In 2004, I completed a two year, 1000 hour, Professional level, Therapeutic Alignment Yoga Teacher Education and Certification program. In 2006, I became certified in Hot 26TM as well as Level 1 Universal Yoga with Andrey Lappa. In August 2007, I successfully completed a 40 hour Vinyasa Yoga Teacher Training - The Art of Sequencing - with Rolf Gates, author of Meditations from the Mat. Having great success with Power Alignment Yoga™ and through the encouragement of students, mentors, friends and family, in 2007, I created three 270 Hour Power Alignment Yoga™ Teacher Training programs: Power Aligment YogaTM, Hatha Alignment YogaTM and Hot Alignment YogaTM which are registered with Yoga Alliance® at the 200 hour level. In 2009 I created three 615 Hour Power Aligment YogaTM, Hatha Alignment YogaTM and Hot Alignment YogaTM which are registered with Yoga Alliance® at the 500 hour level. In 2008, I completed a year long, 500 hour, Therapeutic Advanced Professional level, Alignment Yoga Teacher Education and Certification program. In 2009, I attended 2 - 30 hour Power Vinyasa Yoga Teacher Training Modules with Rolf Gates in Charlotte, NC and am enrolled in Rolf's full 200 Hour Vinyasa Yoga Teacher Training beginning September 2012 in Orlando, Florida! Most recently, I opened Altamonte Springs Yoga in 2010 and The Yoga University of Florida in 2011. Altamonte Springs Yoga and The Yoga University of Florida serve the Orlando Yoga community providing Hot Yoga, Vinyasa Yoga, Hatha Yoga, Prenatal Yoga, Yin Yoga and Yoga Therapy Classes, Workshops, Trainings and Events with local, national and international presenters. In 2011 & 2012 I completed Power Yoga Teacher Training with Bryan Kest and in 2012, I completed a 85 hour Registered Prenatal Yoga Teacher Training Program at Altamonte Springs Yoga. In 2015, The Yoga University of Florida leased a new teacher training facility in Altamonte Springs, Florida. More details coming soon! My interest in yoga include physically challenging styles of Hatha yoga like Power Yoga and Hot Yoga, alignment based Hatha yoga, as well as gentle yoga like Yoga of the HeartTM, meditation, and Pranayama (breath work). Like most of us, I was born with the ability to see energy (clairvoyance), the ability to feel energy (clairsentience), and the ability to hear energy (clairaudience). As a child, I did not understand these abilities and felt overwhelmed. I repressed the abilities for a number of years. My mother died in 1992 and when I began clearly seeing and communicating with her shortly after she passed away, I started to uncover these abilities once more, and I began the process of learning how best to use them. In the Southwest United States, I sought to understand and develop my abilities through meditation and healing with highly intuitive and capable teachers and healers. I attended the prestigious Durango Psychic Institute (DPI) in Durango, Colorado and after graduating from the Clairvoyant Program in 1998, I was invited to the Teacher's Program, where I was professionally trained to teach intuition, meditation, and healing to others. Recently, as part of my continuing education, I studied the Science of Medical Intuition under Dr. Caroline Myss and Dr. Norm Shealy, pioneers in the growing field that links intuition with conventional western medicine.